Michele Chapin studied drawing, printmaking and sculpting at the University of California at Santa Cruz, then went on to such varied jobs as fashion designer, pipefitter and display carpenter in the San Francisco Bay area. In 1987, Michele relocated to Ventura and began a stone-carving apprenticeship with Joanne Duby and Paul Lindhard at Art City. Chapin likes to quarry her own stones from Southern California deserts, often choosing stones with exotic colors whose light-emitting qualities, when carved, give her works an ethereal luminosity. Michele sometimes leaves part of the stone in its natural state in order to create a contrast of smooth and rough textures and of femininity versus masculinity. Chapin’s sculptures have received numerous awards, including “Best of Show” awards at the Ventura County Fair and Art in the Park at the Ojai Music Festival. 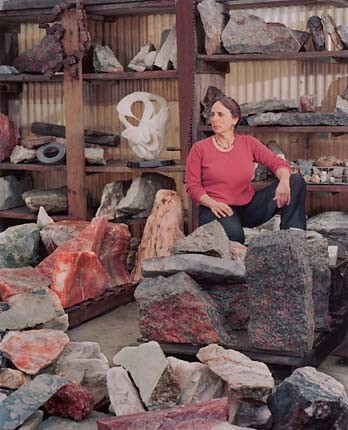 Her works are housed in private and corporate collections, one of which is a monumental granite fountain she created and installed for U. S. Sales Corporation in Moorpark. Michelle Chapin’s documentation took place in 2001. The FOTM Archive contains extensive information about this artist.